Aubrey Hord Photography: Unique Maui Weddings - "I Do!" Now let's go surfing! 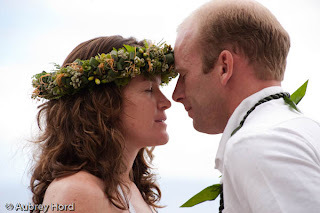 Unique Maui Weddings - "I Do!" Now let's go surfing! 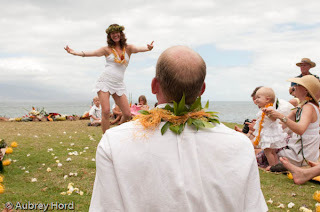 This summer I had the distinct pleasure of photographing a unique wedding on Maui that was filled with the usual vows plus, infectious steel drum music and a wave or two. What?? A wave?? Yes, this bride and groom looooooove to surf and they decided to have a morning wedding that involved a great wave session afterward. The bride performed a special wedding hula for the groom and a little rain blessed the event, making it a wonderful morning. Lia and James are not only a great looking couple, but they are super fit, making it easy for the groom to to slip into board shorts and slippers and the bride to slip into a beautiful white swim suit and designer pareo from Maui's own LeTarte Swimwear. 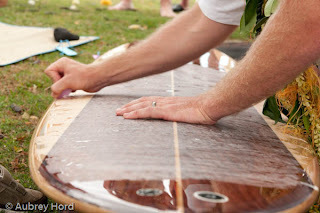 The couple decided to get hitched at the beach and then jump in the water on their beautiful custom made wooden surfboard and invite their guests to go surfing with them. Once the couple said their vows and the minister announced them as officially married, they waxed up their new board and the celebration moved to the ocean. 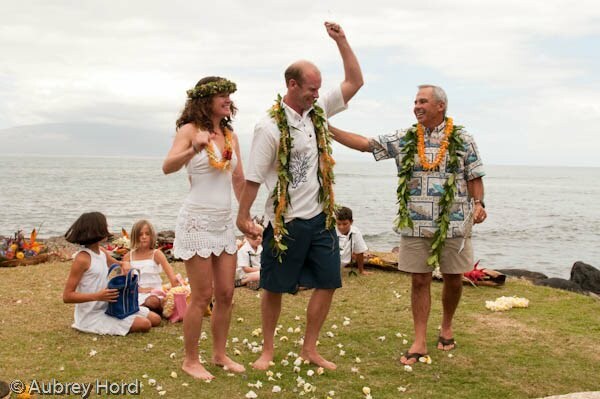 What a perfect Maui wedding! So congratulations and best of luck to Lia and James! May you always find waves together and laugh together for the rest of your lives. how much for a wedding shoot, it doesnt say on your website or blog? Aloha Natalie! Just email me and I can send you packages. info@aubreyhord.com.